Multidisciplinary and international in scope, the Journal of Research on Adolescence significantly advances knowledge in the field of adolescent research. Employing a diverse array of methodologies, this compelling journal publishes original research and integrative reviews of the highest level of scholarship. Featured studies include both quantitative and qualitative methodologies applied to cognitive, physical, emotional, and social development and behavior. 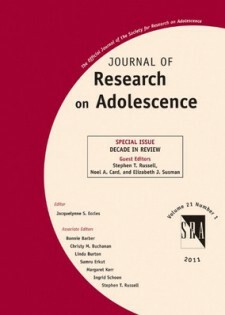 Articles pertinent to the variety of developmental patterns inherent throughout adolescence are featured, including cross-national and cross-cultural studies. Attention is given to normative patterns of behavior as well as individual differences rooted in personal or social and cultural factors.